At some point in our life, we’ve all had that one piece of accessory that we couldn’t say goodbye to, no matter how worn it may have started to look. In fact this would only make us admire it even more; knowing it’s the most favourite item you’ve used day in and day out over the years. Be it for an emotional reason, impeccable design or the perfect material, there’s always that one item we don’t want to let go of.. Here comes the best part: sometimes you don’t have to! We recently had a request from a client who wanted to bring his very unique card case back to life. This special piece was partially made with stingray leather; one of the most resilient leather types available. 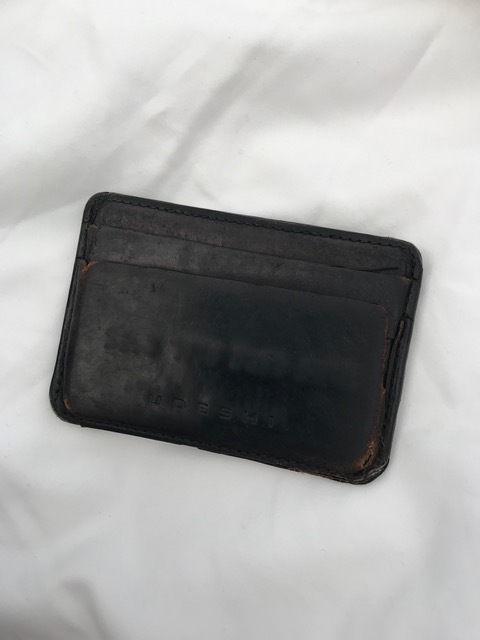 The other side of the card case was made out of black calfskin leather. The stingray skin was so resistant that even continued use over many years didn’t affect its appearance. In contrast, the part with the soft calfskin was stretched thin and some corners of the case had started to rip while other parts were unglued and coming apart from the stingray. After analysing the piece and in consultation with the client, we decided that the best approach would be to build out from the existing stingray and re-construct the calfskin side. 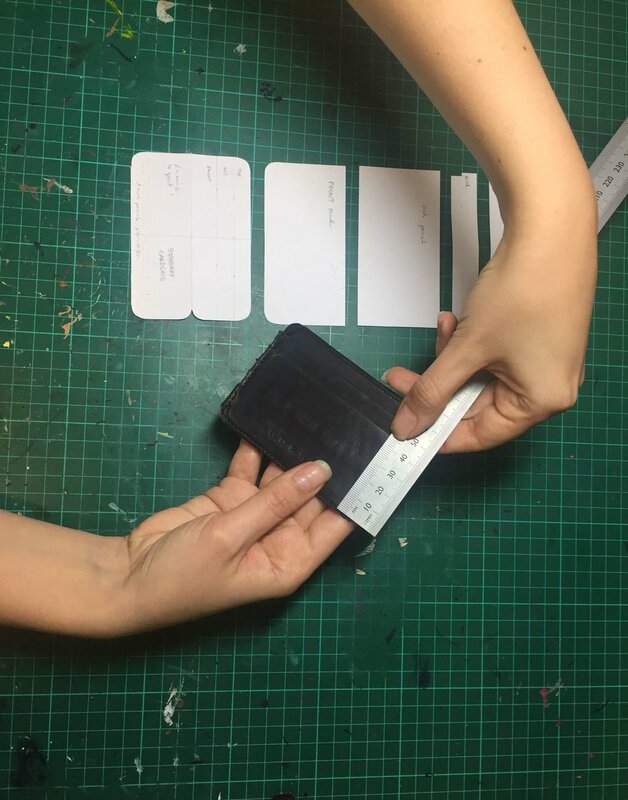 In order to do that, the first step was to take measurements of the original piece, dismantle it and create new paper patterns for the card case. Since the original buttery calfskin leather was so stretched out, the lines of the case were no longer straight. We managed to source a supple but resistant leather to replace the part with the stretchy calfskin and chose a luxurious black goatskin with a polished finish. Once the paper patterns were completed, we ensured the pieces would fit perfectly against the stingray side that showed only minor stretching on the edges. The goat leather was then cut up with the help of the small patterns and the edges of the case were prepared and skyved- which is to shave the surface to reduce its thickness- so that when pressed together, the layers of leather look slim and gives an elegant finish to the final result. The next step was to put together the different pockets and small linings by aligning all the separate pieces and stitching them back together. Finally, the goatskin part was glued to the stingray with special glue that holds ultra resistant characteristics and won’t react to heat. Fun fact: stingray skin consists out of pear shaped hard scales, also called cartilages, that are so tough they tend to break needles. The solidity of the scales makes it almost impossible to produce a neat line of stitching. This is also the reason why stingray is often glued instead of stitched. Note: small leather goods are usually submitted to intensive use and kept in our hands and pockets for long periods of time. This means that the materials are exposed to heat on a regular basis and requires a certain type of heat resistant glue. After assembling all the pieces of the card case, all that’s left was the final touch of trimming the edges and applying the right type of flexible paint to re-edge and seal the case. As a final result, we were able to breathe new life into this uniquely constructed accessory without taking away from the beauty of its original design. Safe to say the outcome left our client nothing less than mesmerised!